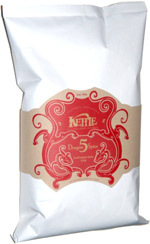 Taste test: This bag (one of the five varieties in Kettle's People's Choice 2007 promotion) contained lots of wide-rippled, kettle-cooked chips, including some borerline ginormous ones. They were seasoned with an Asian barbecue seasoning that encompassed many different spices. The chips had a high level of crispness and a great crunch. 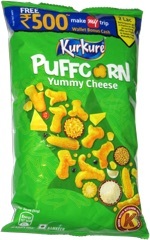 The flavor was strong but not super-intense — weaker than Kettle's excellent Spicy Thai chips. Ditto for the heat, as there was a bit, but not nearly as much as you get from Spicy Thai. People really liked the taste of these, as they earned high praise from the tasters at our chip bowl. Smell test: Nice mix of spices, the ginger is what stands out the most.